Search between a gas station, soccer pitch, and Stunt Mountain is one of the week four challenges in Fortnite Battle Royale season five. Just like the other “search” challenges, it is considered to be a hard one, giving the battle pass user 10 stars upon completion. Title holds the major clues that will help you find the location of the hidden battlestar. If you’ve been playing Fortnite for a bit you should already know what Stunt Mountain is and the location of very few soccer pitches in the game. If you are having trouble finding it, we’ll make sure to make it easier with our Fortnite BR Gas Station, Soccer Pitch, Stunt Mountain location guide. Having clues like “soccer pitch” and “gas station” in the name pretty much reveals all the info about the whereabouts of the battle star. 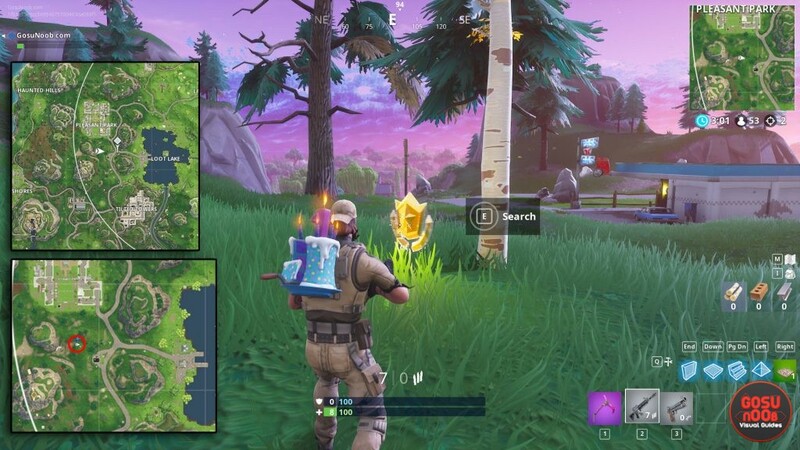 This time, the two closest locations matching these descriptions are located in the northwestern part of the map – near Pleasant Park. Considering this is a place that dates from the first days of Fortnite, most players are quite familiar with its soccer pitch. The location of the gas station is in the southern approach to Pleasant Park. You can spot it on the map, just like the other gas stations, by its distinguishing dark rooftop. It’s close to a crossroad with the road that leads to the docks further east. The final clue, Stunt Mountain, is the tallest one in the area. It has eight birches on its top, with a couple of shopping carts, one chest, and three stunt ramps. Once the week four challenges are up and live on Thursday August 2nd, 2018, players will be able to see and collect this battle star. Considering there is a possible weapon spawn location on the nearby gas station, the players who like to binge the weekly challenges can find safety in numbers as they land here to find and complete the challenge.